Liz Mitchell is one of New Zealand’s leading couture and ready to wear designers. Her clothes are chosen and worn for their gorgeous colours, sumptuous fabrics, classical design, impeccable tailoring and attention to detail in every aspect of their construction. With a label founded on design excellence, Mitchell focuses on creating unique and quality pieces that can be enjoyed over a number of seasons. “I think the clothes we create have an enduring quality and that's always interested me,” she says. With a background in fine arts and theatre, Mitchell brings a sense of drama to her sophisticated designs. 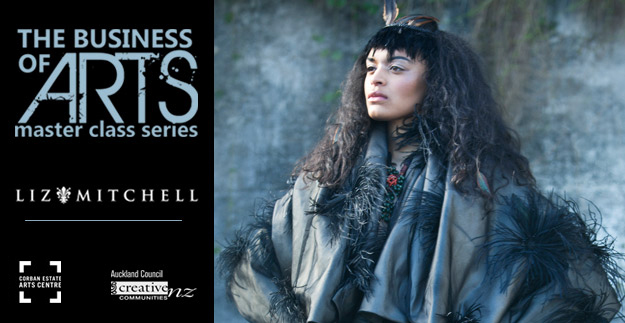 In 2005 Mitchell was appointed a member of the New Zealand Order of Merit for her services to the fashion industry. Her knowledge of and respect for design history is reflected in her own work. Her exquisite evening wear, glamorous made to measure garments and elegant ready to wear designs are an expression of modernity, with a whisper of tradition. "You are not just recreating the past; it is about giving a garment a past, present and a future." In this Master Class she talks with arts consultant Tara Jahn-Werner about the realities of creating her work in an often harsh economic environment. She has had her share of difficulties – in 2010 her company went into voluntary liquidation after suffering a downturn in sales and orders. But she survived and set up again, focusing on her core products and moving her company forward as a leaner entity, and coming through, as she says, stronger and hopefully wiser. Originally from Holland, Hellendoorn attended high school in Wellington and went on to complete a Fine Arts degree at Massey University, majoring in painting and sculpture. His medium of choice at present is paint, however he often uses photography to generate drawings and explore ideas. Arie has also experimented with video and live performance with the incorporation of found objects. 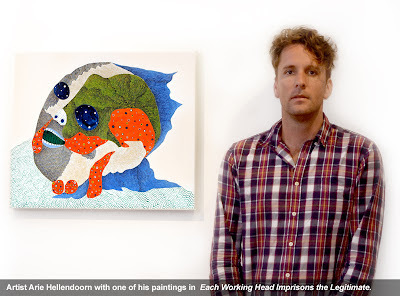 With his formal art background, Hellendoorn’s artistic influences are vast, ranging from New Zealand painter Tony de Lautour to international artists George Condo, Dawn Mellor and Lisa Yuskavage. Each of these artists produces slightly off-putting, eerie artworks that unsettle the viewer in their reinterpretation of established symbols and compositions. Perhaps it is this uneasy vibe which has led Hellendoorn to presently explore the process of sampling and constructing paintings from found images located in books, photographs and the internet. Within these images Hellendoorn creates compositions which incorporate his own painted language, creating a confrontation between the original meaning of the found images and their new context. As a result, the paintings themselves as objects/surfaces become meaningless and it is up to the viewer to imbue the paintings with meaning, which will inevitably change over time with its audience and its context. Hellendoorn has maintained an interest in involving the viewer in the interpretation and development of meaning in his artworks throughout his artistic career, and encourages spectators to form their understanding using their own associations to colour, shape, subject and context. This is particularly pertinent to Each Working Head Imprisons the Legitimate as the artist hopes the image will instigate viewers to start questioning where the human form ends as he believes it is incredibly fluid. 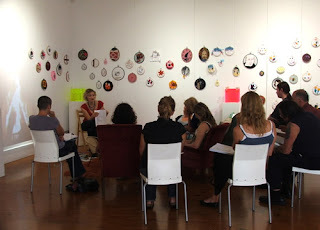 “I am interested in how this new form of communicating and connecting affects our emotional relationships with others..."
As demonstrated by her latest exhibition, Simpson is specifically influenced by science and scientific developments, especially the relationship between science and our perception of ourselves as humans. When asked which artists she finds particularly influential, Simpson rattles off numerous individuals who work in a variety of media, such as data visualiser David McCandless; expressive painters like Max Gimblett and Judy Millar; sculptors like Louise Bourgeois; video artists like Jed Town, Greta Anderson, Bruce Nauman; photographers like Ann Shelton and Nan Golden; as well as installation artists like Yayoi Kusama. However, her favourite artist at the moment is Roland Flexner, a French artist based in New York City. Manipulating ink and graphite – such as blowing ink bubbles onto paper through a specially made straw to drop instant circular artworks, Simpson primarily loves how Flexner is a “master of his medium – but part of that mastery is allowing the material to behave in its own uncontrolled way”. 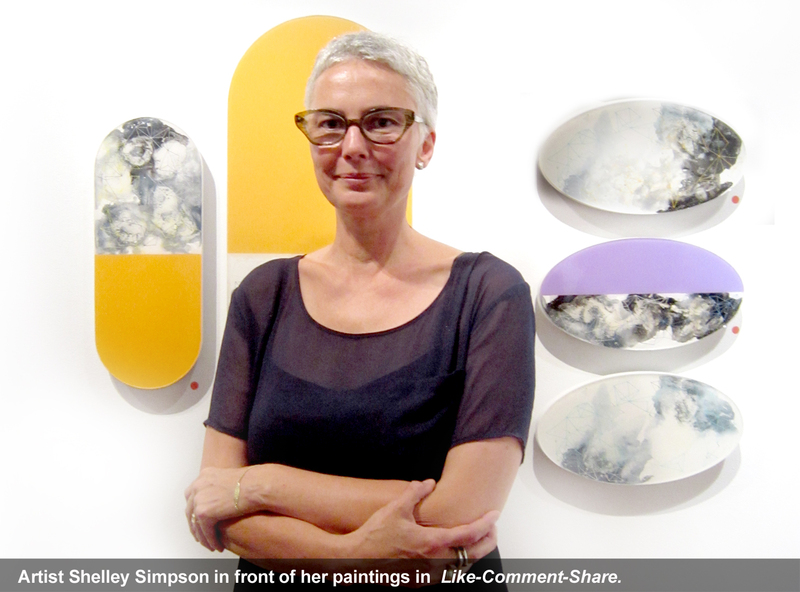 While not formally trained in the visual arts, Simpson holds a BA in History and has attended several art courses in New York and Auckland, and was most recently a participant in the AMP year-long mentoring programme hosted at CEAC and led by Anne-Sophie Adelys and Andrew Tolhurst. Her range of media is not limited to painting, having created several video projects in the past including the interactive work Subduction at ARTSPACE in Auckland. This was a submersive interactive experience where users played a midi keyboard which triggered projected video and audio. At one end of the keyboard the video samples were all natural, while at the other the samples were all based on technology. This work was also produced as a video and was included in the 1998 NZ Film Festival in the Moving Image Centre Short Cuts programme. Interaction appears to be a key element of Simpson’s art practice, having collaborated at Artstation with Esther Lamb for the project Hoopla!. Funded by Creative Communities, Hoopla! Invited participants to complete a circular, textile-based artwork in a wooden hoop. The hoops were displayed on the walls of the gallery and then returned to the maker at the end of the show. 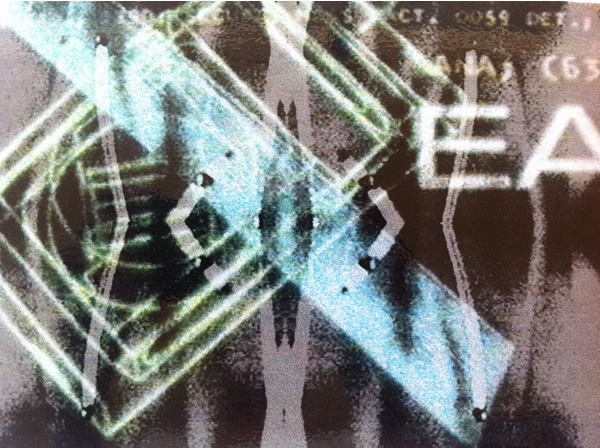 You can check out Simpson’s work in Gallery 36’s upcoming group show 4 Years On at Pearce Gallery, April 4th – 8th 2012. She is also working on completing a number of private commissions as well as developing a new series of paintings that take her current technique in a different, more personal direction. Auckland-based artists Anne-Sophie Adelys, Vaimoana Eves and Harvey Benge, will present solo exhibitions exploring nostalgia and memory at Corban Estate Arts Centre from 20 April – 27 May. These three exhibitions use disparate materials to stimulate emotions in the viewer related to the past and reminiscence. Re-Collection by Anne-Sophie Adelys references kitsch and contemporary styles to incite visual triggers in the spectator by clustering together an assemblage of items from or inspired by the mid-20th century. Adelys investigates the feeling of nostalgia and how such a relationship develops between the viewer and an object. Vaimoana Eves’ exhibition Play Space involves interactive soft sculptures which act as a vehicle for exploration. The child-like, playful, yet disturbingly sensuous objects trigger common personal narratives and memories in the visitor. Visitors will be invited to interact directly with the sculptures and consider their instinctive responses to the activity. Harvey Benge’s series Against Forgetting sees the camera artist return to his childhood home in Auckland’s Mt Roskill and look at his past through the lens of the present. Benge’s exhibition incorporates objects found on his expeditions through the neighbourhood of his youth as well as old photographs to illustrate his nostalgic journey.